Our new pizza sauce offers pie lovers the opportunity to add a beloved Dell’Amore touch to homemade pizzas. The always-perfect blend of rich tomatoes and distinctive seasonings creates a flavor explosion that is ready to be spread on your next pizza. Is your mouth watering yet? I am a HUGE fan of your tomato sauce as you know – I even had a testimonial on your old site. I am excited to try the Pizza sauce..will it be available at Costco in Milford, CT anytime soon??? As always, thank you for your nice compliment about Dell’Amore Marinara Sauce. We also appreciate you inquiring about our new Pizza Sauce. 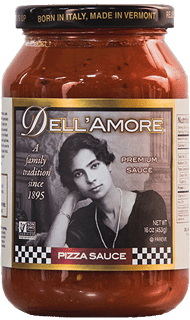 Unfortunately, at this time, Costco doesn’t have any plans to bring Dell’Amore Pizza Sauce into their stores. Currently, it’s only available at select stores here in Vermont, or you can order online. We hope to expand its distribution soon, however. When I received a jar from Frank to try his pizza sauce I was skeptical. But, when we had pizza night and made my homemade dough and put the sauce on I felt like I was in Little Italy New York. I swear this is the best homemade in store quality sauce I have ever tasted. So smooth with the exact amount of herbs. We were eating it by the spoon out of the jar I had to order more immediately.